In February we had small session of RAD Ballet and ISTD Modern exams and again had great results. In April we took part again (7th year running) in Poulton Gala, with lots of dancers walking in the procession. A group of our older girls performed a number of times during the procession, which given the crowds the gala attracts, requires some confidence! In October we took part (we opened the show!) in the ‘HITS’ show at the Opera House performing a “High School Musical” piece choreographed by Lucy. It was fantastic fun as usual and the girls were great on stage. In November we were invited to perform in a variety concert to celebrate the reopening of Vicarage Park Community Centre. A group of older girls represented JC Dance beautifully and we were honoured to open the show with “Smooth Criminal” and also perform “This is Me” both of which were choregraphed by Clare. 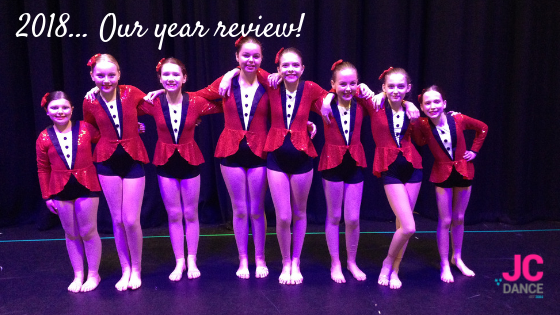 The first weekend of December brought our 14th annual show, and it was a brilliant weekend and a very full show, with hopefully something for everyone… thank you to those who took time to send feedback following the show, it’s much appreciated. Rounding off the year was Christmas Jumper Week in aid of Save the Children, thank you to everyone who took part, some of the classes looked extremely festive! I wonder what 2019 will bring? See you all then (classes re start 7th January)!